This book looks at repair/reinforcement technology, which is based on the use of adhesively bonded fibre composite patches or doublers and can provide cost-effective life extension in many situations. From the scientific and engineering viewpoint, whilst simple in concept, this technology can be quite challenging particularly when used to repair primary structure. This is due to it being based on interrelated inputs from the fields of aircraft design, solid mechanics, fibre composites, structural adhesive bonding, fracture mechanics and metal fatigue. The technologies of non-destructive inspection (NDI) and, more recently smart materials, are also included. Operational issues are equally critical, including airworthiness certification, application technology (including health and safety issues), and training. Including contributions from leading experts in Canada, UK, USA and Australia, this book discusses most of these issues and the latest developments. Most importantly, it contains real histories of application of this technology to both military and civil aircraft. For aerospace engineers and scientists, marine, automotive and civil engineers, materials scientists, structural analysts. Introduction. Introduction and overview (A. Baker). Materials and Processes. Materials selection and engineering (R. Chester). Surface treatment and repair bonding (A. Rider et al.). Adhesives characterisation and data base (A. Baker, Chalkley). Fatigue testing of generic bonded joints (A. Baker et al.). Evaluating environmental effects on bonded repair systems using fracture mechanics (L. Butkus et al.). Design Procedures. Analytical methods for designing composite repairs (F. Rose, C. Wang). Recent expansions in the capabilities of Rose's closed-form analyses for bonded crack-patching (J. Hart-Smith). Numerical analysis and design (R. Jones). Share optimisation for bonded repairs (M. Heller, R. Kaye). Thermal stress analysis (R. Callinan). Fatigue crack growth analysis of repaired structures (C.H. Wang). Experimental Patching Studies. Boron/epoxy patching efficiency studies (A. Baker). Glare patching efficiency studies (R. Fredell, C. Guijt). Graphite/epoxy patching efficiency studies (P. Poole). Repair of multi-site damage (R. Jones, L. Molent). Damage tolerance assessment of bonded composite doubler repairs for commercial aircraft applications (D. Roach). Validation of stress intensity estimations in patched panels (B. Aktepe, A.A. Baker). Bonded repair of acoustic fatigue cracking (R. Callinan et al.). Smart patch systems (S.C. Galea). Certification Issues. Adhesively bonded repairs: meeting the safety requirements implied within existing aviation industry certification regulations (D. Bond). Certification issues for critical repairs (A. Baker). Nondestructive evaluation and quality control for bonded composite repair of metallic aircraft structures (D. Roach, C. Scala). Application Considerations. Practical application technology for adhesive bonded repairs (M. Davis). 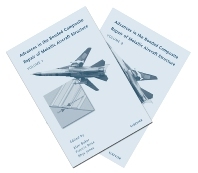 Rapid application technology: aircraft battle damage repairs (R. Bartholomeusz et al.). Standardised training and certification for bonded repair specialists (M. Smith). Recent Applications and Demonstrators. Case history: F-11 lower wing skin repair substantiation (K.F. Walker, L.R.F. Rose). Case history: composite doubler installation on an L-1011 commercial aircraft (D. Roach). Case history: F-111 wing pilot fitting reinforcement (R. Chester). Case history: bonded composite reinforcement of the F/A-18 Y470.5 centre fuselage bulkhead (R.A. Bartholomeusz, A Searl). C-5A fuselage crown cracking (C. Guijt, S. Verhoeven). Case history: F-16 fuel vent-hole repairs (C. Guijt, J. Mazza). Reinforcement of the F/A-18 inboard aileron hinge (A. Chester). UK applications (P. Poole). Case history: repair applications on DC-10/MD-11 aircraft (D. Roach). Case history: CF-116 upper wing skin fatigue enhancement boron doubler (D. Raizenne). In-service durability of bonded composite repairs - commercial demonstrator programs (R.A. Bartholomeusz, R,C, Geddes). Case history: bonded composite repair of A CH-47 cargo hook beam (B.J. Harkless et al.). Case history: application of bonded repair technology to large areas (B. Harkless, A. Kerr). Case history: composite patch repair reinforcement of T-38 lower wing skin (M.M. Ratwani et al.). Case histories: advanced composite repairs of USAF C-141 and C-130 aircraft (W.H. Schweinberg, J.W. Fiebig). Case history: bonded composite reinforcement of ship structures (I. Grabovac).